The Long Version: When I first decided to go back to writing for a hobby, I never really expected anyone but me to see it. As a result, I chose a template design that I like for my own reason, and not the one that's the simplest, most legible, or most appealing. Making matters worse, over the past eighteen months I've increasingly gravitated to simple monochrome layouts, and shot-on-white photography. The look of the blog was not working the way I wanted it to. The new layout is a better match to my other websites, looks more like my photography, works better with my Blackberry, and uses Verdana throughout, which is a more legible humanist sans-serif and a better match for my usual Myriad. I like it, and hopefully it makes the site easier and more pleasant to read. 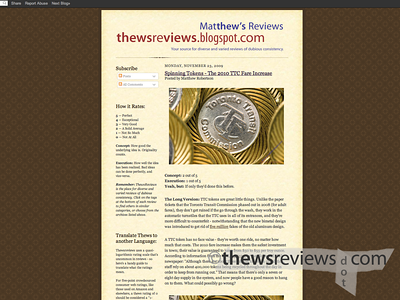 And a bit of thewsreviews trivia: I picked the old template as a tribute to the original blogger site for The Online Photographer. I've been playing with a new layout on my test site for a little while now, and finally made the switch in honour of TOP's fourth birthday. I've previously mentioned that the Luminous Landscape is one of my top three influences on this blog; TOP and Mike Johnson is one of the others.